In Ayurveda, ghee is considered one of the most easily digestible fats. 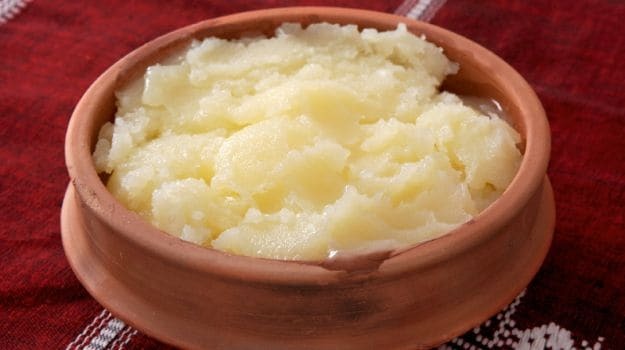 Contrary to popular belief, desi ghee can help you lose weight. Desi ghee only uses cow's milk which is lighter and healthier. When I was a child, Desi Ghee was a part of everyday life on the dairy farm run by my grandmother. 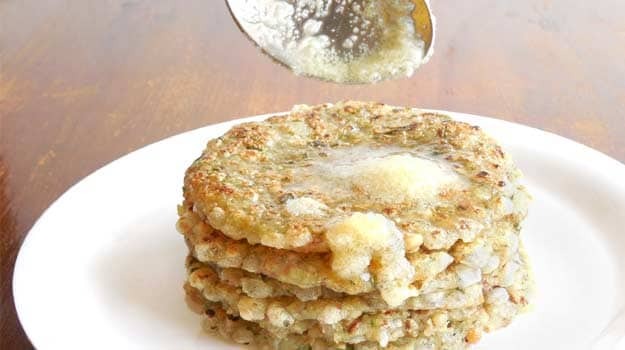 It was poured generously atop rice, brushed over chappatis, rubbed into my skin and even massaged on my hair. I was made to believe that it's the most delicious thing ever and a natural cure for any ailment. Years later, nothing has changed - only the fact that I've now moved to an urban jungle and the steel jar of freshly made ghee has been swapped with a glass bottle bought from the superstore. Nothing, really? Desi Ghee is made with cow's milk and it was usually churned at home by heating white butter. It smells and tastes different but no less than butter. The sweet and nutty flavour is not as assertive as other oils. In fact, the use of desi ghee dates back to ancient India when cooking oils didn't even exist. The Vedas regard this golden liquid as the 'first and the most essential of all foods'. Bengalis and Gujaratis, enjoy it with the quintessential khichdi. Rajasthan pairs it with dal-baati and the Punjabi halwas would never taste as good without a dollop of Desi Ghee. It has a high heat point, so it doesn't burn easily (while other oils may break down and release free radicals when heated at high temperatures) and because Indian food requires a lot of sauteing it's quite sensible to use it. In Ayurvedic wisdom, religions or the kitchens of India, Ghee is central to our culture. I often stood by my grandma, chin on the kitchen table, watching her make a holy drink on festive occasions. Milk, yogurt, honey,sugar and the fifth element of Panchamrit, the Sanskrit word for five elixirs, is ghee. I loved the taste. I still do. If she ever heard me sniffing, she would run into the kitchen and come back with what she'd call a magic potion. A teaspoon of warm ghee mixed with two-three ground blackpeppercorns. It worked wonders. It still does. According to Dr. Ashutosh Gautam, "In Ayurveda, ghee is considered to be very rejuvenating. It is one of the most easily digestible fats used for cooking. Ghee is a natural remedy for balancing the heat element (pitta) of the body. It aids in digestion, prevents constipation and helps in the excretion of toxins. Having half teaspoon of ghee with moong dal khichdi is a great way to detox." "As kids we were given a teaspoon of ghee every day - primarily for strengthening our immunity, and for bone development. It's good for bone strengthening and muscle growth because it has fat soluble nutrients like Vitamin A and E. When I developed rheumatoid arthritis my doctor advised me to have a teaspoon of Desi Ghee daily. This keeps the joints lubricated and prevents inflammation," shares Food Writer Priyadarshini Nandy. If ghee has such wonderful advantages, why are we afraid of using it regularly? In my previous article, I talked about a time when we were bombarded with scientific studies that gave saturated fats its unhealthy reputation - a claim that now seems questionable. It is this constant yo-yoing between what's good and what's bad that made us ignore our granny's advice. Dr. Rupali Datta, Clinical Dietician at Fortis-Escorts Hospital in New Delhi, agrees, "The increasing burden of heart disease is more due to our sedentary lifestyle and excess consumption of processed foods. Anything in excess will produce negative results. It's time to go back to our roots and eat what our grandmother's ate." "The three macronutrients in a balanced diet are carbs, proteins and fats. Fat is required for normal metabolism and insulation. It maintains your body temperature and is a source of energy. As per the guidelines of the National Institute of Nutrition, your body requires 25 grams or 5 teaspoons of visible fats daily. So, if you devote a teaspoon or two towards ghee, there's nothing wrong. Ghee contains naturally occurring saturated fats and cholesterol and some amount of it is essential for your body and heart health. It's a rich source of the good fats like the monounsaturated and polyunsaturated fats. It's also a rare source of vitamin K12, which helps to reduce calcium deposit in the arteries. It might have the same calories but it definitely scores higher than refined oils like sunflower, safflower or corn due to these additional qualities" she adds. We've also been told to stay off ghee as it is a diet buster. Celebrity Nutritionist Rujuta Diwekar sets this myth straight by calling desi ghee the 'fat that makes you thin'. In her book, 'Don't Lose Your Mind, Lose Your Weight', she explains that the type of saturated fat that Desi Ghee has is the short-chain-fatty acid. This helps to burn the stubborn fat in the body while regulating your metabolism. Dr. Rupali cautions me that no one cooking medium is ideal and we should use a combination of oils and fats. Moreover, not all cooking oils can be called healthy. Vegetable oils are mostly refined to make them stable which is a nasty chemical process. The seeds are subjected to oxidation and hydrogenation that may remove the natural nutrients from them. It's safer to alternate between good quality desi ghee and pure oils like mustard oil, sesame oil, or olive oil for a balanced diet. At the supermarket, you'll either be confused or ignorant. This time around I decided to linger a little longer. Dairy farming is now a commercial industry where every product faces fierce competition. Keeping this in mind, most of your popular brands offer the same value in terms of nutrition and price. The question you need to answer is what your pack of ghee really contains? Flip over. On an average, I found that 100 grams of ghee contains about 850 calories, considering it is nothing but milk fat. When the ghee is made with cow's milk, the pack will scream 'Cow's Ghee'. In others that subtly say 'Ghee' or 'Pure Ghee', they've either used buffalo's milk or in all probably mixed both to keep the price down. "Desi ghee is made only with cow's milk and no preservatives. Ghee made with cow's milk usually has a yellowish hue while that of buffalo's milk is white in colour. Cow's milk is better than buffalo's milk as it lighter and has less phosphorous which makes the absorption of calcium easy," says Dr. Ashutosh Gautam. The other thing I noticed is that some labels mention trans-fat (about 3 grams per 100 grams, FSSAI allows the use of trans-fat in certain limits). These might be naturally- occurring fats or sometimes trans-fat is also used in preserving food and giving it texture. Interestingly, most of the organic brands did not contain any. Ila Lumba who runs Lakshar Farms at Mangar Village tells me, "At our farm, we only have desi cows whose milk is known for its high quality protein. Dairy industries mostly depend on Jersey or hybrid cows for better yield and this can be a contributing factor to the fact that they are able to maintain a competitive price. We only get 1 kilo of ghee from 30 to 32 litres of milk and so our prices tend to be steep, about Rs. 2000 per kilogram. Then again, we only use traditional methods to make ghee which is free of any chemicals and requires effort. The use of machinery to extract milk and hormonal injections to produce more is no secret in the industry. On the other hand, our cows are fed organic fodder like jowar and jai grown at the farm. Also, we allow the calf to have the mother's milk in order to let the milk down naturally. Our ghee has a better, cleaner flavour because it's fresher." I still prefer good, honest ghee made at home. You know where it comes from and it has no additives, nor has it been subjected to any complicated processing. It's easy to make as long as you're attentive. 1. Boil about four litres of full cream milk and let it cool for about 3 - 4 hours. 2. You'll find a layer of thick cream or malai on the top. Scoop it out gently and keep it aside. The milk can then be used for any purpose. 3. This would happen everyday in my house, layer after layer of malai collected in a bowl and refrigerated till enough. 4. On Sunday mornings, all of it was whipped and churned by hand. While you continue, it turns frothy and you will see the milk solids or white butter separate from the liquid called buttermilk. Buttermilk is quite flavour and can be used in bakes, pancakes and even in salad dressings. Drain the liquid and collect the white butter. 5. Melt this white butter over low-heat in a heavy-bottomed pan. As it melts, tiny white particles will be formed. Keep stirring to avoid burning. Let it cook till you see a clear, golden liquid that will float atop. If bubbles appears, skim off and discard. Be careful not to overcook. Comments6. Once ready, filter the liquid through a sieve to separate the particle which may have turned brown. These were often used to add crunch to barfis. When the liquid cools down, it solidifies. Store it in an airtight jar.